You say you can't afford the full monty of TechArt's Magnum package? (Dr. Freud call the front desk.) Don't think yourself a halfling, just slap on the German Porsche tuner's new Cayenne aerodynamics kit. If your potency is indeed in question, though, your therapist may recommend the Magnum's 600-hp twin-turbo V8 upgrade. 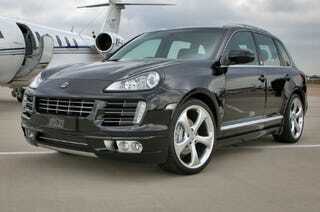 The new TECHART SUV - Aerodynamics I in package. The globally renowned enhancer TECHART Automobildesign is presenting an extensive technology programme at the IAA 2007 with a brand new individualisation programme for the TECHART SUV on the basis of the Cayenne (model 2008). Through the Aerodynamic Kit I, the TECHART SUV is given its perfectly formed line with an unmistakable recognition value. The front spoiler, sill panels and rear diffuser have been revised and lend the TECHART SUV its sporting and elegant look. All chassis parts are manufactured as first fit made of PUR-RIM plastic. The sporty off and on-road vehicle thus receives the dynamic line of the Cayenne Facelift. The TECHART Sport Module provides the option of lowering the SUV chassis by an impressive 30 millimetres - which simplifies road use and makes it more attractive. The entire adjustment range from the load level to the special terrain level is roughly 110 millimetres. As an option, the TECHART SUV on the basis of the Cayenne Turbo can be ordered with a performance of up to 620 hp / 456 KW. A carbon cover and individually modified painting of various engine parts round off the engine optic package for this automobile highlight. In terms of tyres and rims, the designers from the House of TECHART leave none of their customers' wishes unfulfilled - the options range from Formula I rims in 10x20 ET 55 with 295/40 ZR 20 or 10x22 ET 55 with 295/30 ZR 22 on front and rear axles through to TECHART Formula II light metal rims in the dimensions 10.5Jx22. As an optimum tyre for the Formula II rims, the enhancers recommend ContiCrossContact UHP tyres in the size 295/30 ZR 22. The format for the TECHART SUV is not simply characterised by state of the art technological standards, but also by the endless repertoire of countless options for the interior. Exclusive accessories include ergonomically formed sports steering wheels, state of the art multimedia systems or carbon applications for the cockpit in various colour options. More individual wishes can be fulfilled with exclusive TECHART full leather fittings in all conceivable colours and upholstery designs. A particularly precious version is the TECHART interior line de Sede of Switzerland, which is created in cooperation with the Swiss furniture manufactory. The high quality de Sede leather hides, which are processed to produce perfectly crafted covers for seats, door and side panels, instrument panels, roof side members and roof in the in-house TECHART upholstery shop, complete the automobile work of art of the TECHART SUV.